Jita for short is an opinionated Wildstar chat client built from scratch with the aim to be lightweight and to run standalone while providing a number of handy features out of the box. It has a different paradigm than current ChatLog as it tries to move away from WoW's confined chat windows style to something more akin of a traditional chat application; something similar to EVE's chat; hence the reference. It's important to note that Jita is on rolling beta and there might be bugs and that it favors features over costs. It's also worth noting that Jita will not disable Carbine's ChatLog upon installation. That choice is left to the player. Jita comes with somewhat of a wall of text as a first run greetings message to help users navigate its interface. This section is to briefly describe the most relevant part of the UI. General: Is one tab where players get to pick and choose what channels to follow at a time. Local: Regroup system, /say, /yell and /emote channels. Nexus: One and only /nexus. 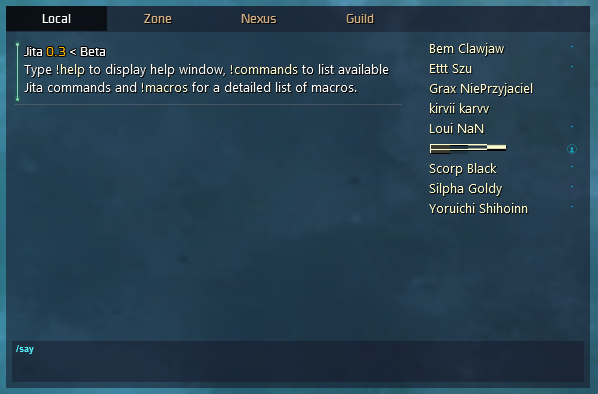 Guild Officer, Zone PvP, Party, Instance, Players channels, Circles, Whispers and Account whispers chat tabs are closed by default and set to automatically open on incoming new messages. Alternatively you may access them from Quick options via the wrench icon on the top right of the interface. To filter the list of aggregated channels on General, select the tab first then on Quick options. Left click on a tab button to select a chat, Wheel click to quickly close a tab and Right click to clone a chat on a new window. Enter to set chat input in focus. Shift+Enter when sending a message will attempt to keep it in focus.